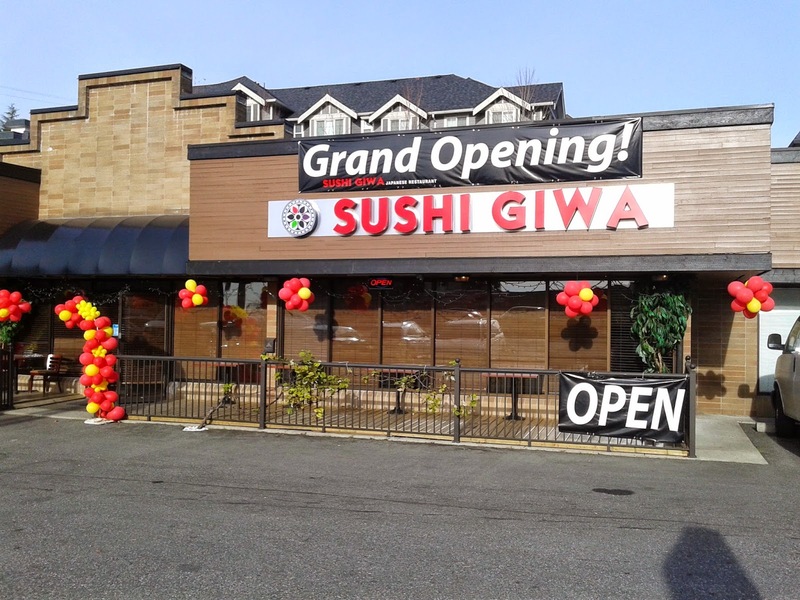 Sushi Giwa, a new Japanese restaurant, opened up on Hastings near SFU right beside Sushi Town just a few weeks ago. I pass by Hastings frequently and noticed signs of it opening months ago and was waiting endlessly for the restaurant to actually open, and it finally did! My friend, Declan, kept recommending that I try it, so I brought him along with me for my first visit. The restaurant is located in the small plaza at Holdom Ave. and Hastings and has ample parking space. The interior decor was a clean modern design, and I liked the addition of the artificial white blossoming trees. 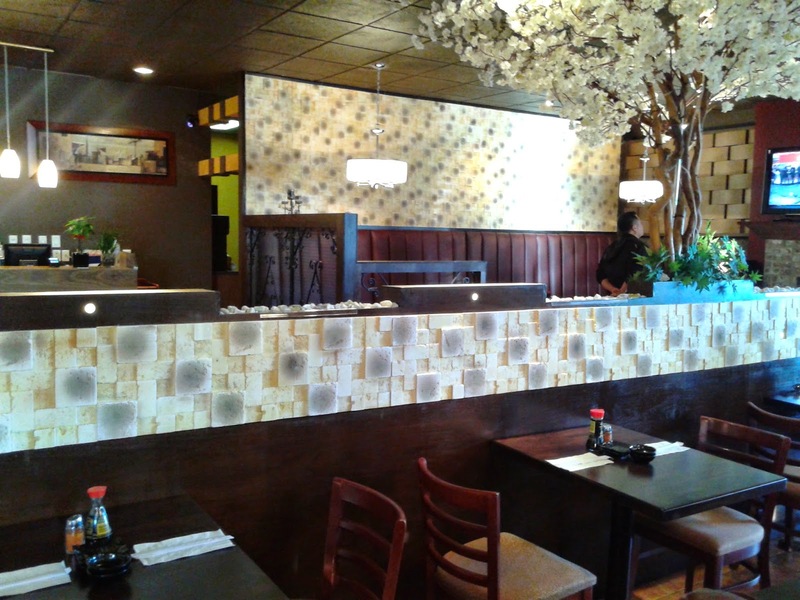 Compared to the bustling Sushi Town nearby, it has a more relaxed atmosphere and more friendly service. Sushi Giwa's menu is also more extensive and the seating arrangements are spaced out quite comfortably. The restaurant is Korean-operated, and there is a $9.99 specials menu consisting of several Korean dishes, such as Japchae, Bulgogi, etc. Declan seems to have a preference for ordering Korean food at Korean-run sushi restaurants, so he got the Spicy Pork. On the other hand, I prefer to sample the Japanese food, so I ordered everything else you see below in this blog post. 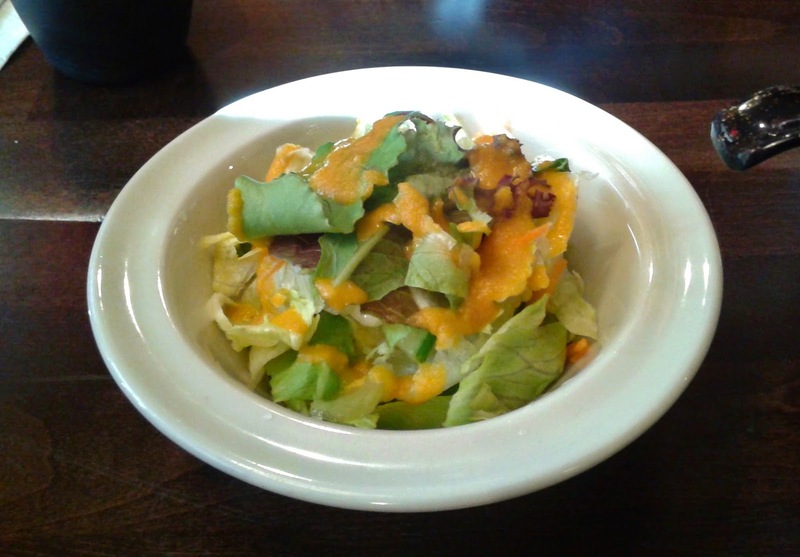 The Salad came with the Spicy Pork and was a generous portion dressed with a mild citrusy vinaigrette. The Miso Soup was also one of the items to accompany the Spicy Pork. I didn't have this one, so I asked Declan how it was. 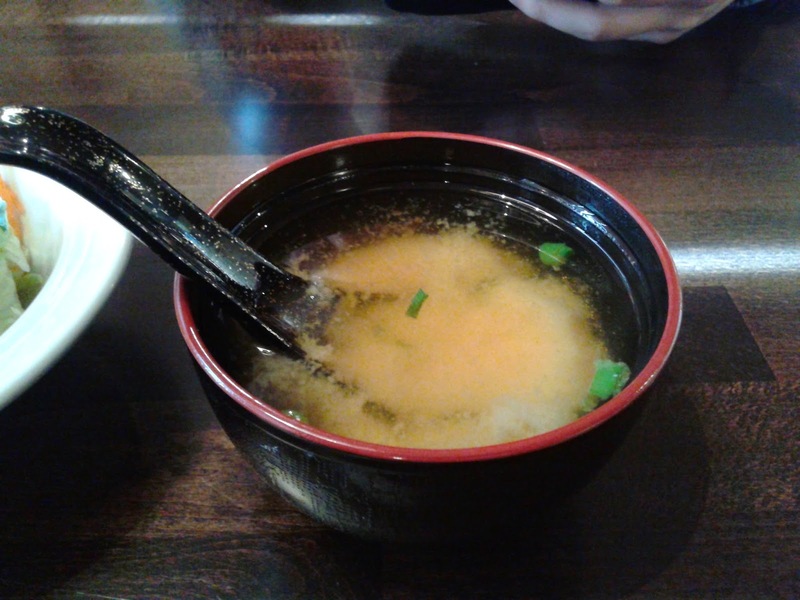 His reply was "So hot ... pretty good ..." Alright, I guess we have some idea of how the miso soup was. Overall, they were very generous with the seafood with the nigiri. The unagi (BBQ eel) was soft and had a nice smoky flavour along with a hint of a Chinese pineapple bun flavour. The unagi sauce was added in appropriate amounts and worked well to bring out the flavour of the eel on top. The toro and tuna were both fresh with well-balanced flavours and no metallic taste at all. The ebi (shrimp) was not marinated in ginger so it had a more natural flavour. The tai (snapper) was not tough and sliced to just the right thickness, while the salmon had a vibrant, creamy and sweet taste. Unfortunately, there was a mishap with the preparation of the sushi rice and the three nigiri on the right side had large hard, gummy clumps of rice inside them. The three nigiri on the left did not have the same issue. 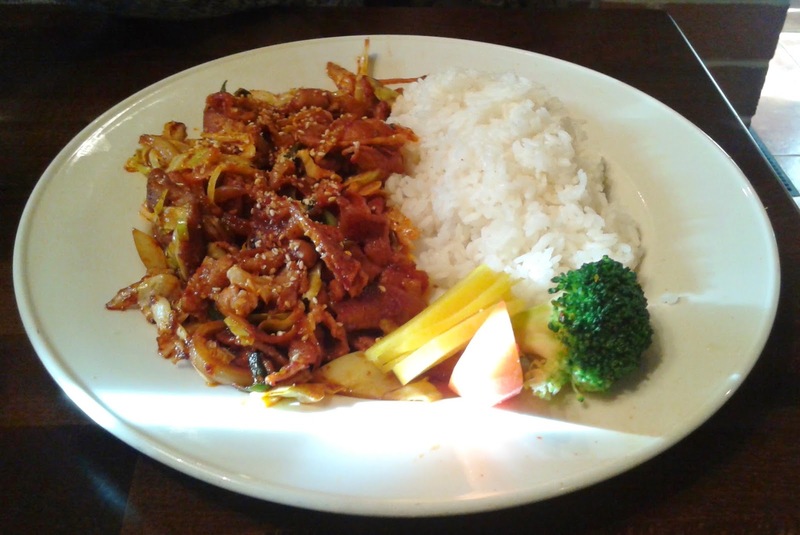 The Spicy Pork ($9.99) was a Korean dish that consisted of stir-fried spicy pork and vegetables with rice. I liked how the meat was tender and well-prepared, though the flavours were a bit toned down. It was moderately spicy to me (and mildly spicy to Declan). The pork would benefit from a more savoury sauce. 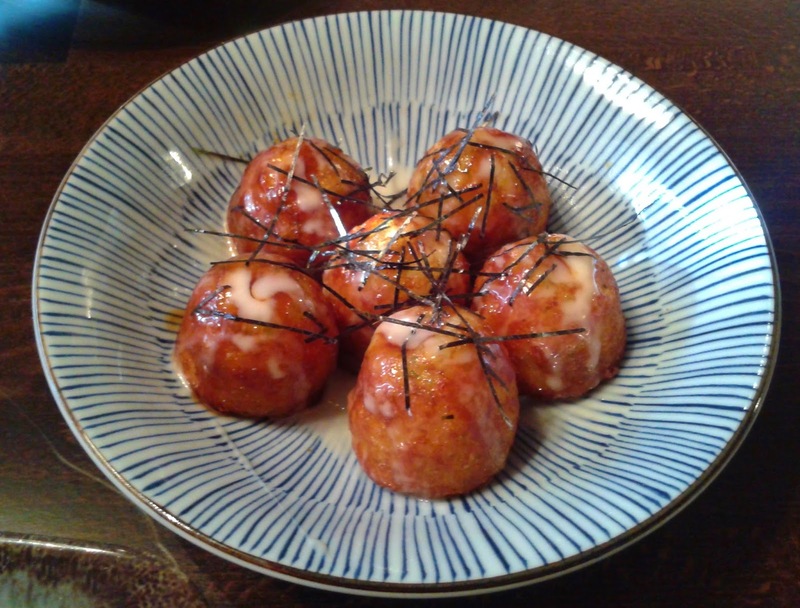 The Takoyaki was served quite hot and the outside was slightly crispy with teriyaki sauce drizzled on top. There was a very small amount of octopus inside which made it more detectable that the flour was slightly stickier than usual. 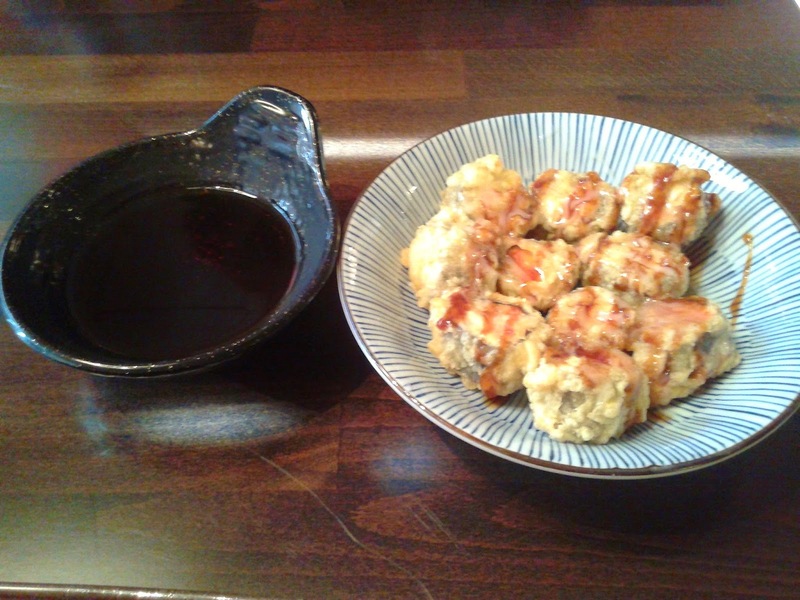 The Kanisake Tempura (crab + salmon tempura) came with 10 pieces instead of the stated 8 pieces (a good thing). I liked how the inside was soft and had enough moisture while the light batter on the outside allowed the flavours of the crab and salmon to dominate. However, I found the outside (the batter itself) to be just a bit harder and drier than it should have been. The Giwa House Roll consisted of prawn tempura, crab meat, avocado, lightly fried salmon, tuna, assorted vegetables, and mozzarella cheese. The roll was quite massive and on the top, there was a tower consisting of chunks of salmon and tuna which were fried to project an aromatic flame-seared feel. The cheese was sufficiently melted and well-integrated with the salmon and tuna. There are about 8 (I lost count) large pieces of rolled sushi with varying thicknesses on the bottom. Some were a little hard to pick up, some were too creamy and some were just fine. I should have given a few more pieces to Declan, as the richness of the sauces underneath made it difficult for one person to finish most of the roll (yes, Declan, that's why I was taking forever). There were several servers present during my visit and the early lunch hours were not busy for them, so I received high-quality service. Several servers came by to refill our water and tea and asked us about the food. 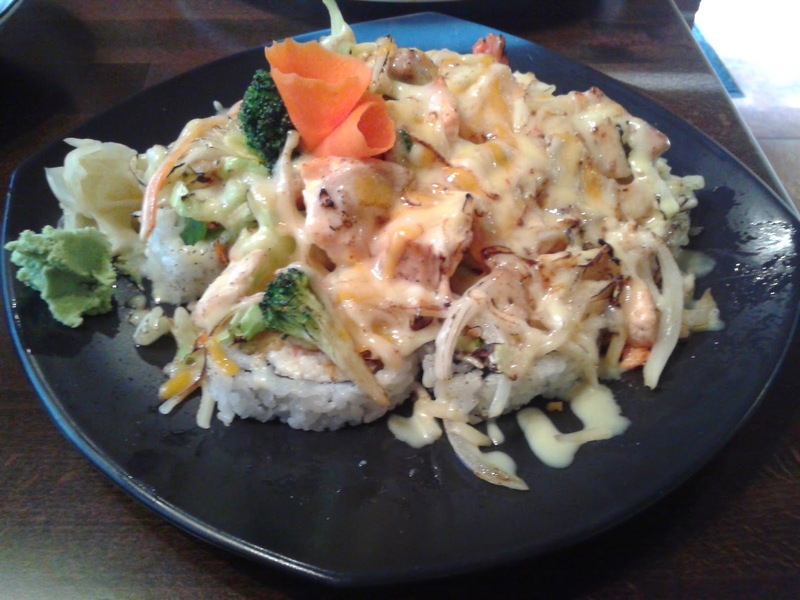 As for the food, there are a few tweaks here and there that could be made (such as increasing reliability with the sushi rice) for a more consistent dining experience. The prices were very reasonable and the portion sizes were quite generous. Compared to Sushi Town, each restaurant has its own merits and I cannot definitively say that one is better than the other. You always have such bad rice stories LOL. Like that restaurant with dried up rice on the bottom of the pot in the nigiri? I forgot where that was, but gross.